A press release was added to Royal Mail's media webpage yesterday (15 March) although it must have been sent to the press at least the day before, announcing the issue of the British Humanitarians set of stamps. From Tuesday 15 March until Monday 21 March each of the humanitarians will be recognised by an individual postmark. We've already mentioned the ONE YOU slogan used in conjunction with a National Health Service campaign to get us to be fitter, or more healthy, but I'm repeating the earlier one here (South Midlands, 5 March 2016), together with the alternative layout (Gatwick 11 March 2016). 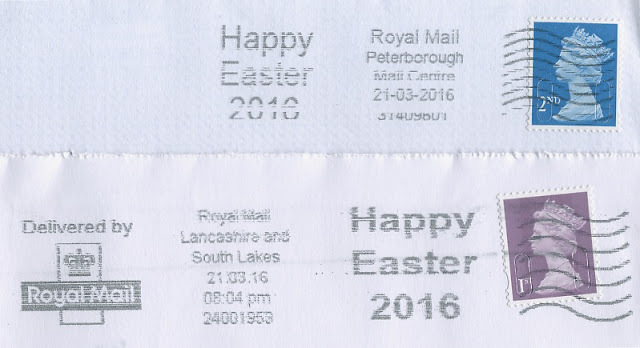 The One You postmark is not shown in a press release on the Royal Mail media webpage, and neither are any of these, in no particular order as we don't know the period of use. Don't forget Mother's Day 06 March 2016 from North West Midlands on Thursday March 3rd, and from Mount Pleasant on Friday March 4th in the alternative layout without the zero preceding '6 March'. The Happy St David's Day slogan was actually used at the end of February but is included here because the relevant day is 1st March. No idea whether this was used nationwide or only in Wales or only on mail addressed to Wales. This is apparently used from SE Wales MC, but could have been from Birmingham, the other location using the Child Rescue Alert slogan. March 3 was World Book Day, and this slogan was in widespread use. Shown is a SE Wales example, and the alternative layout from Mount Pleasant, both used on 2 March for mail delivered on the actual day. The latest to arrive is for British Science Week, once again to 10 days extended from 11-20 March, and so running in partial parallel with the Humanitarians slogans. This one from Bristol Mail Centre 12 March. Update 23 March - Happy Easter! One format from Peterborough Mail Centre and the other from Lancashire and South Lakes, both 21 March. Thanks to Trevor and members of Stampboards for the news and many images, Mike C, Mike M, John G and Robert1943 for the latest updates. More will be added as the month continues.